We’re very proud that our Future Leaders of Nottingham programme beat off competition from 24,584 nominations to make it through to a shortlist of just 124 in this year’s National Diversity Awards. Representatives from the project went along to the award ceremony on Friday 14 September to join in a national celebration of diversity – including current and past Future Leaders April Chung, Elira Mano, April Holmes, Mick Graham, and Jazz Hayer, together with Imogeen Denton from Nottingham City Council, Michael Henry from Communities Inc, Anita Hodson from Nottingham City Homes and our CEO Cherry Underwood. 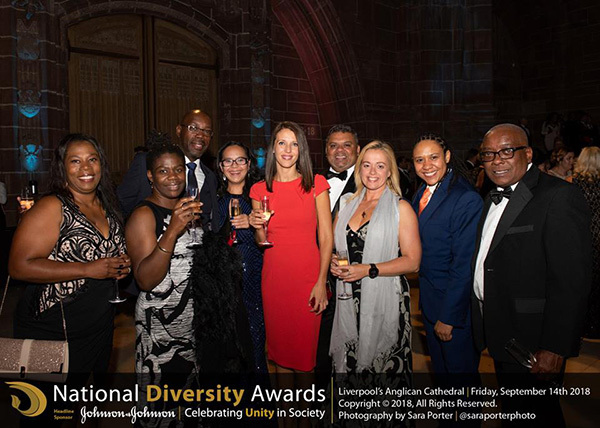 The National Diversity Awards are the largest of their kind in the country and the Future Leaders of Nottingham programme was shortlisted for its contribution to equality, diversity and inclusion in the UK. Congratulations to everyone involved including all our Future Leaders past and present and our programme partners – Nottingham City Council, Nottingham City Homes, Nottingham University Hospitals NHS Trust, Communities Inc, Futures Advice Skills & Employment and Nottinghamshire Fire & Rescue Service.